Shopping for furniture to fit an apartment is easy when you know the size of each room. Armed with room measurements, you ensure each piece of furniture will add the right touch of comfort you want. Opt for multi-functional and versatile pieces for best dollar values. Seating is a vital necessity to any apartment. Most spaces allow for either a sofa or loveseat and a chair. You can maximize this space with the right furniture pieces without sacrificing function, style, and design. You aren't prohibited from using a sofa in your apartment. There are several styles that address the unique requirements for a smaller living space. You may opt for an armless design to create the visual effect of more space, instead of an overstuffed design that may prove too bulky for a smaller living room. Apartment-sized sofa: This sofa style ranges from 56" W or 68" W, which are significantly smaller than the average sofa sizes of 72"W to 96"W. You can usually get the same kind of styles and fabrics offered in larger sized sofas. 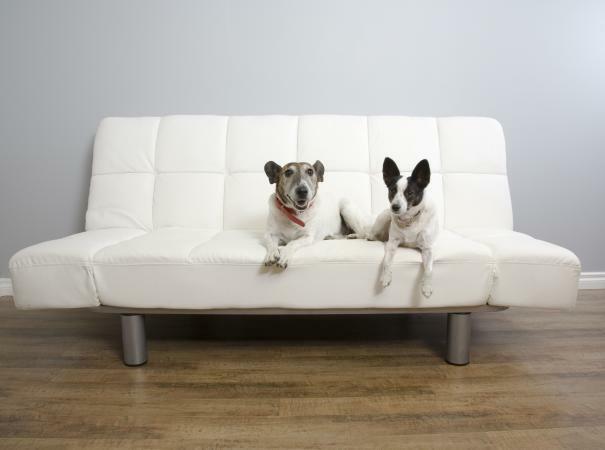 Of course, you can always opt for a sleeper sofa is you don't like the futon look. Loveseat: A loveseat might better fit your space. The most popular ones are the standard size of 60"W, but you can find smaller and larger sizes. These are available in a wide range of styles. Sectional: A sectional can be an ideal choice since it can fit into a corner and still look appropriate. Sectionals come in a range of sizes and shapes, such as a curved configuration or reversible chaise. If you have a large enough living room, you might be able to sneak in a medium-sized sectional. Futon: A futon (75"W - 79"W) provides additional sleeping space and is especially nice for one bedroom apartments. Futon frames include metal and wood. Frames can be substantial or very subtle, even mimicking upholstered furniture styles. Mattresses range from thin foam to coil and foam designs in twin, full or queen sizes. Some designs offer increment reclining options. Your budget can help narrow the shopping choices for this multi-seating piece of furniture. Decide on the style you like the best and select pieces within your color palette. Traditional: This style can take up more space than modern styles. Be mindful of room and furniture dimensions, but don't be afraid to go with the style you like. You may like overstuffed couches. These offer a warm comfy decor that's inviting. Simply add fluffy pillows to give depth and breakup the bulkiness. You can add glass-top round end tables and a pair of straight-back side chairs to keep the room from appearing overcrowded. Modern: This style tends to have sleeker lines than traditional pieces. This lean design can help conserve space. Leather is often a fabric favorite; however, a rich velvet upholstery can soften lines and add warmth. Retro and art deco blend well with this style. Contemporary: This style is usually less formal than traditional. A reclining loveseat in a microsuede or leather is a very popular choices. Depending on the design, this can take up the same amount of space as a traditional loveseat. Be sure you have enough space for reclining. Add one of these styles to your apartment. Sofas: APT 2B offers many styles, colors, and textures available for apartment-sized sofas (around $900 to $1500). Loveseat: Havertys offers the power-reclining Manning loveseat with a pillow-arm design. Available in tobacco brown vinyl (around $1900). Sectional: SofaMania gives a great modern sectional choice with the Studio Collection. The linen upholstery is available in blue, green, gray, orange, red and yellow solid colors. The chaise is reversible so you can use either a right or left configuration. Its dimensions are 77"W x 50"D x 33"H, with a 17"seat height, and 20" seat depth (around $280). Futon: Amazon adds value with this Divano Roma Furniture Collection futon. The contemporary design features a plush tufted cushion and seat back with upholstered arms. You'd never suspect it was actually a futon. This futon (77"W x 31"D x 31"H) has a split back that allows for easy conversion into a bed (70"W x 40"D). A linen fabric available in brown, orange, light blue, dark gray, light gray, and light purple. If you need a guest bed, but don't have a guest bedroom, then a futon is an easy fix (around $230). Additional seating can be provided by using side chairs or armchairs. Rocking and glider chairs may take up more room than you have; it depends on the size and design. Several styles of chairs work well for apartment living. Ladder back chair: A simple ladder back chair with a cushion can pull double duty with a dining table. This style goes well with almost any décor. You can repurpose old chairs by painting different bright colors for a modern or contemporary decor. Arm chair: A traditional thick-padded armchair, this style can be also be used in a contemporary or country décor. Slipper chair: This petite chair style offers elegant comfort without taking up a lot of space, Most styles are armless and range from modern to traditional. One of these options creates additional seating to your apartment. Armchair: Pier 1 Imports will add style to your apartment this armchair (31"W x 37.50"D x 35"H) available in flax linen, blue velvet, red velvet, olive green velvet, three florals/prints, a white/blue seersucker and coffee brown/tapestry upholstery. Regularly priced at about $500. Slipper chair: Lazboy's Nolita Premier Stationary Occasional Chair is a petite, armless slipper chair and ideal for a small room. Countless upholstery fabric choices range from solid colors, patterns and leathers. You can customize with several other fabric choices (around $570). Ladder back chairs: These chairs are a great look for a country style décor for around $120. These white wood chairs with natural woven wicker seats can double as dining room chairs. Add floral cushions and a lumbar pillow for colorful touches. There are many styles of end tables and coffee tables that are apartment sized. In a small space you need to be mindful of creating too many vertical lines that leggy end tables and coffee tables can create. You can easily avoid this distracting design with your table choices. Select a design that is both useful and stylish. Bookcase end table: There are many ways to combat this challenge with the traditional look of a bookcase style end table This provide storage space while giving a nice table surface for a lamp and decorative objects. You may prefer to use baskets on the shelves instead of books. Coffee table: Coffee tables can be rather useless and a space hog unless you opt for a multi-functional one, such as contemporary design that includes hideaway stools. Modern cube coffee table: Some of the leather or fabric cubes feature removable tops that when turned upside down reveal a tray. The cubes are hollow and offer good storage space. Some come as a set with the cubes also serving as ottomans. This style is best suited for a modern or contemporary décor. A traditional style might feature velvet or chenille upholstery. Lift top coffee table: A lift top coffee table offers hidden storage that's good for remote controls, magazines and game. It can also double as a dining table ideal for in-den dining. This can fee up the space you might have use for a small in-kitchen dining table for a more serviceable piece of furniture, such as a pantry or buffet. Pick up one of these tables for the living area. End table bookcase combo: Wayfair offers Bel Air (30"H x 36"W x 14"D) standard bookcase that can also be used as a nightstand or end table. Price: Around $176. Available in charcoal, ivory, chocolate, sand, cherry and espresso finishes (around $175). 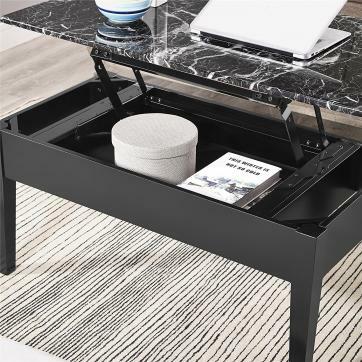 Lift top coffee table: Save dining space with this storage coffee table (22"W x 40L x 18"H) featuring a faux marble top that lifts up. The top can be lifted to reveal concealed storage space. Use the lifted top for a dining table. Available in black ($around 100) or brown (around $125). Cocktail table with seating: Houzz presents the Magnussen Juniper glass top coffee table and stool set (20"H x 40"W x 40"D) is constructed of hardwood and glass in a four mink-brown finish. The four wedge pull-out stools (ottomans) nest under the table when not in use. Each has a matching wood finish with camel colored microfiber upholstery (around $560). Double storage ottoman with tray tables: Walmart features Jameson storage double ottoman (36"W x 18"D x 18"H) with two tray tables conversation and two nesting mini-ottomans (each 14"W x 14"D x 14.5"H) and available in brown or black. Crafted from rich faux leather, this set provides a stunning chic look. You can use for storage or for informal dining for two. With space being a premium in an apartment, you most likely won't have a dedicate room for a home office. You can select a corner in the living room or bedroom to place a desk and possibly have enough room for a bookcase. Consider one of these styles to add dedicated office space in your living room. Modern desk: A Scandinavian design with cubbies and drawers quickly becomes a modern statement piece that can carry your modern decor deeper into the room. Country/Coastal look: You may prefer the neatness of a secretary desk that gives a classic country or coastal look in a white finish. The slant desk is hinged and can be closed when work is over. Contemporary bookcase: Choose a contemporary look with a narrow bookcase that features a bottom cabinet with double doors. This can be a companion to your office niche. Tall and bold bookcase: Select a bookcase that is outstanding and eye-catching with the classic touch of glass doors. You can find this in traditional, modern, contemporary and other styles. This is a great for additional storage. You'll find these options functional and stylish. Vacca desk: Wayfair has stylish and compact desks, such as the Vacca (47"W x 23.8"D x 30"H) in gray and wood finish drawers for storage (around $200). Add a Tamzen green and gray chair with an adjustable lumbar support pad for a great modern look (around $350). 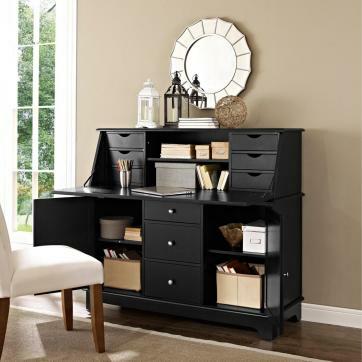 Secretary desk: If you need an office corner, Hayneedle offers a desk (51"W x 19"D x 45"H) in a black finish with multi-storage options that include 10 drawers, a large base cabinet with a hutch and hinged slant top (around $ 750). Narrow bookcases: Crate & Barrel presents a storage solution with this Italian hand-painted bookcase (15"D x 34"W x 77"H) finished in a rich, multi-step grey finish with contrasting white interior. You can store books or display collectibles on the three shelves. The unit features a drawer that is ideal for storing silverware and two adjustable shelves protected by double doors ideal for china storage (around $1,200). Tall glass door bookcase: Lamps Plus takes advantage of going vertical with this high double glass door bookcase (71 3/4" H, 27 1/2" W, 14"D) in a tobacco finish. The design includes five shelves and one bottom drawer (around $200). Kitchens and dining areas in apartments are typically small. There are several furniture solutions for this challenging space that can help you achieve a stylish chic look without an overcrowded appearance. Kitchen tables: There are several options for dining tables. The best solution is a drop-leaf table that is narrow when closed. Place it behind a couch when not in use. Add a couple of lamps and plants for a cozy look in the living room. Round table help make smaller dining areas appear larger. Glass top tables create the illusion of more space. Select a pedestal table so you have more leg room when dining. Dining chairs: Armless chairs, such as a Parson's chair will take up less space than arm-dining chairs. You may prefer folding wood chairs that can be stored easily or moved to the living room for additional seating. 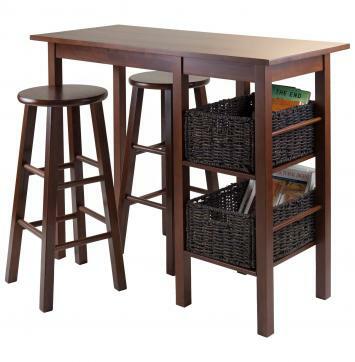 Bar-height table and stools: A bar height table with stools that can be tucked underneath the table is a huge space saver. You can set the table against the wall or a window. Some come with shelves and baskets so it can double for storage or do double duty as a serving buffet table. Buffet: You can always use extra storage in any home, but especially an apartment. A buffet can be used to store china and dining linens as well as a serving station. One with drawers, cabinets and shelves can provide a lot of extra storage place. Pantry: Something that may be missing from your kitchen is a pantry. You can add a small or tall one depending on space available. This is a valuable additional storage option with needing shelving space and can even fit in a corner or between doors. Pick up one of these useful options to get the most out of your kitchen space. Round pedestal table: A round table (44"Diameter x 30"H) is a space saver aided by a pedestal base that frees up leg room. West Elm presents a marble table top set on a cone-shaped metal pedestal (around $1000). Gateleg table: This table style when folded is only 12.5"w x 36"L, 48"l or 60" L, when extended it forms a square. You can use it as a sofa or console table when not in use. Turn it into a dining table by lifting each side leaf and extending the gateleg to support the leaf. This style will fit in a contemporary, rustic or mission decor. Available in wood and aluminum inlay or without (around $436-$720). Round crop leaf: Light oak colored 42" round table made of solid and composite woods. It's about $140 from Quill (29.5"H x 42"L x 42"D). Mid-century velvet upholstered dining chair: This West Elm dining chair (20.5"W x 24.5"D x 32.5"H) is available in dove gray, lagoon and wasabi colors. The design features metal legs in an oil-rubbed bronze finish (around $250). The chairs add elegance and are ideal for a smaller dining area. Parsons chair: Walmart offers this beige tufted dining chair (19"W x 25"D x 40"H, 19.75"seat height) is an economical and stylish choice (around $80). It doesn't take up a great deal of space since it is armless and sleek in design. Folding Mission chair: Bed Bath & Beyond features a Mission style folding chair in a walnut finish. The faux leather seat provides a nice rich contrast in black. This chair is sturdy with a weight capacity of 275 lbs. Fold away in storage when not needed (around $50). Breakfast table and stools: A simple dining solution is Target's 5-piece Egan set. This a bar-height table (36.16"H x 44.88"W x 19.69"D) with built-in shelves and four matching wood stools (29.10"H x 13.60"W x 13.60"D) in a walnut and chocolate finish (around $240). The ensemble fits snuggly against the wall when not in use with two stools tucking underneath. The other two stools can be stored against the wall or used for needed breaks when standing for long cooking times. Pantry: Jet offers a framed door pantry (21.5"W x 14.49"D x 61.1"H) storage solution with the Sauder Summer Home Pantry in a Carolina Oak finish. 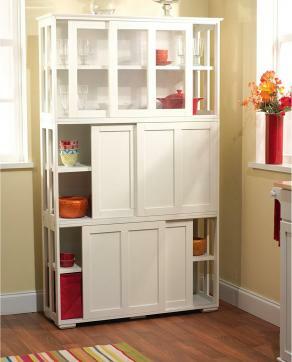 The pantry features three adjustable shelves (around $116, save when buying more than one). Many apartments don't provide enough storage space, especially when it comes to bedroom closets, you can add furniture that will give you valuable storage options. 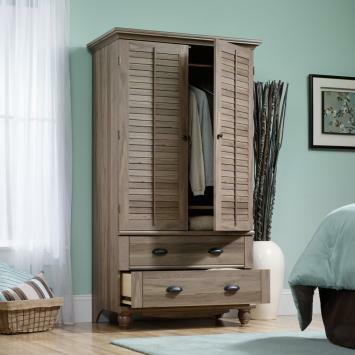 Armoires: Before there were bedroom closets, people used armoires. Most apartment closets aren't dream walk-in size, so you can add some additional hanger, shelf and drawer space with an armoire. There are many styles available in different finishes. For a contemporary or glamourous style, consider a mirrored armoire. This helps create the illusion of a larger space. Louvered doors in a driftwood finish suits a beach style decor. A classic arched carved armoire is ideal for a traditional decor whereas a smaller armoire with a single door might fit your bedroom better. Murphy bed: One of the best ways to save space is with a murphy bed that can be closed inside a cabinet when not in use. More contemporary designs take advantage of this feature by incorporating a desk or sofa when the bed is closed. This is an excellent option for a home office where you may need to accommodate guests or a one-bedroom apartment. It's also a good choice for a studio apartment. Armoires: Hayneedle offers several armoire styles. Choose one that provides different shelf and rod configurations along with a couple of drawers. Pricing starts around the $160 mark and goes into the thousands, so there is something for every budget. Murphy bed and sofa combo: Breda Beds gives you living space by day and sleeping space by night with this InLine Murphy Bed and InLine Sofa. The unit features a sofa in a wheat berry color and pull down chocolate-finished murphy bed combination that is a great way to double up on livable space for less than $3,000. Murphy bed and desk combo: HiddenBed offers a twin-sized Murphy-style bed and desk combination that is great when you need a work space and sleeping solution. The unit features A-1 veneer of unfinished maple, oak, cherry or walnut, ready for you to apply your own stain. Desk space great for computer use, sewing center or a craft work table. Dimensions include 59"H, 84"W, 50"D (desk and bed projection), 15" clearance and 24"D desk. The mechanism is guaranteed for 10 years (around $2,100 to $2,500). 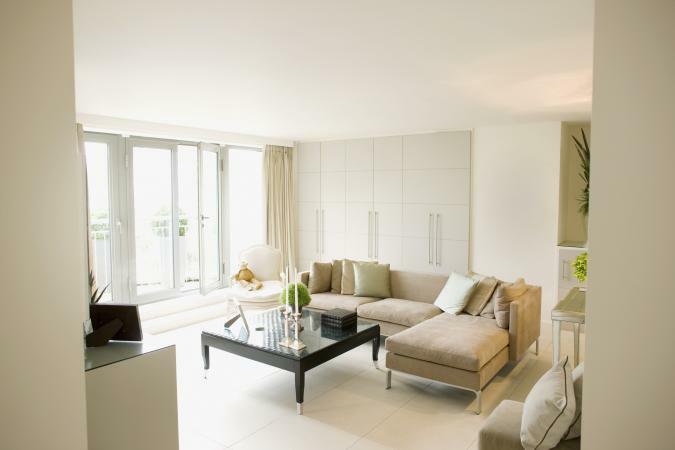 The right furniture can make an apartment seem more spacious than it really is. Consider the available space and choose key pieces as focal points in your design. Taking time to plan your purchases according to available space ensure you'll end up with a home décor you love and can enjoy for years to come.